Listen to "Autism Awareness" on your iOS and Android device. 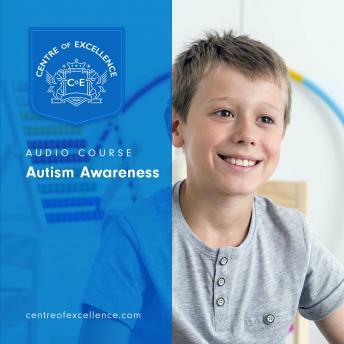 This comprehensive course, written and developed by a leading authority on Autism, will teach you everything that you need to know about Autism, what it is, how to spot the signs and symptoms, diagnosing Autism, the gender differences in Autism, treatments, therapies, interventions and strategies, how to make reasonable adjustments, adults and children with Autism and Inclusion. Autism is estimated to affect one in every hundred people in the UK, although in the US their current estimate is one in every sixty-eight people. Autism is a neurological condition which means that the Autistic Brain is organised in a different way. There is no cure, and it affects the way someone with Autism sees, perceives and processes the world around them. The impact of Autism is individual , every person with the condition will have a different set of symptoms and difficulties. However, common to all with Autism are poorer social skills affecting how they communicate and interact with others. Loved this audio course, I learnt a lot of really useful information. Lovely narration and great content, would recommend to others.